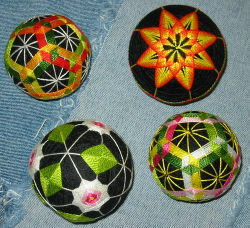 Temari are beautiful little thread balls. They don't have much more use than any other ball. They bounce a little. They're pretty. I like to make them to keep my hands busy on road trips or while watching movies. They're low-key and relaxing. They're amazing demonstrations of non-Euclidean geometry. Maybe a flexible tape measure. Roll a little ball of yarn, to the size you want your ball to be. Tie a knot in the end of the yarn. Thread your needle with the thread you have a lot of, but DON'T snip the thread from the spool! Make a stitch through the knot in the yarn and into the ball. Don't lose your needle in the ball! Make a few more stitches through the ball using the tail of the thread, until the thread is difficult to pull out of the ball/ the tail of the thread has run out. Put the needle away somewhere safe. Wrap thread around and around the ball in all directions. Wrap firmly. Try to use this wrapping to make your ball as spherical as possible. Keep wrapping until you can't see anything but your wrapping thread. Leaving a long tail, cut the thread from the spool. Thread the needle with the tail and make many stitches, all over the surface of the ball, to hold threads in place and to secure the tail. Pro tip: You can wrap with two colors at once, if you want! You get a gorgeous, deep texture and your ball is covered faster. The making of temari is essentially geometric. So we need to subdivide this sphere with evenly spaced points. This is the step where you may find a flexible ruler useful. I just do it by eye, but you can be more precise if you want. Place a first pin directly into the ball. Place another one directly across the center from the first pin. Place another pair of pins to create a line across the center that crosses the first line at a right angle. See the first picture. Repeat to complete a set of three-dimensional right angles. The ball should now look like the second picture. One of the pairs of pins will be the poles, and the other two pairs will form an equator. It doesn't matter which is which; they are identical at this point. Subdivide your "equator", halving each section. See the third picture. Subdivide each of these sections again. See the fourth picture. Pro tip: This is not the only way to subdivide your sphere; if you're interested in other non-Euclidean geometric patterns, you can position your pins differently. Here are some examples of different geometric base patterns. Without tying a knot, stitch through the ball several times, until the thread is difficult to pull out of the ball. Tie off by sewing the tail into the ball just like when you attached it. Attach a piece of thread. Wrap a line of this thread around the equator. Wrap, don't stitch! You can do this several times if you want a thicker line. With the same piece or a new piece of thread, wrap from pole to pole at each pin on the equator. Wherever threads cross, make a small stitch to tack your guide threads into place. I double- and tripple-wrapped my threads to make decorative varying thicknesses. Using your guide lines, stitch around in a pattern. I stitched at the base, over three lines, at the top, over three lines, at the base... and around and around, to get a petal-like pattern. Stitch only at corners. Otherwise, wrap. Repeat on the other side of the sphere. Repeat the pattern you've stitched with all of the colors you have lined up. I worked outward, making a layer of purple, a layer of another purple, a layer of teal, etc., building outwards. If you want one color to be thicker, you can repeat it as many times as you want. I stitched the gold thread over three times. You'll notice that the threads don't always want to stay where they're put. You can push them back into place with your needle, and to keep them there, you can make a tiny stitch over the top of a color where it crosses itself. I did this only with the gold thread. Look at that lovely temari! You can give it to a friend, a relative, a child. You can display it. You can make a loop of thread and hang it from a tree or a chandelier. You can make more, in different colors, patterns, sizes. Update: I have added some pictures of other temari I've made, for inspiration! I think I have the same book, mine have styrofoam balls at the center also. I did these a couple years ago. One ended up as a gift to our favorite Japanese restaurant (which has since closed). They were done for a contest hosted by a Japanese seed bead manufacturer. probably just put different colored beads on a string that you wrap around the ball. I'm trying them right now!!! While Styrofoam doesn't crumble now, it has recently been discovered that various plastics (acrylics & as well as Styrofoam) are stating the disintegrate - after many years. I would hate to do all this work and then have my great-grandchild have her/his inherited ball start to collapse. They might also start to collapse if stepped/sat upon or played with by that special pet! The person who turned me on to this art said the center/support ball can be made of dryer lint, cleaned animal hair, anything that can be formed into a tight ball & then wrapped with leftover yarn. It takes a little more work, but may be well worth it in the long run. Plus it is easier to put the 'love message' inside if you wrap the basic started ball, right. I saw a book, and they used styrofoam as well. The one I saw they cut the ball in half and placed tiny bells inside as well. Sapete se esistono corsi per imparare quest'arte? Ι have so many embroidery threads and now they will come handy with this tutorial - thank you so much! beautiful! Thank you for sharing. And i love your bowl, too! You are very talented! Wow! this is amazing! Never heard of this, will have to try! TFP! I have attached a couple of pictures of ones I made - you can go so many directions with this. I start with styrofoam balls, cut in half, hollowed out, filled with a few rice grains and glued back together. Makes a nice rattle. if you are going to make this for one of your kids, write down a wish you have for them on paper and put it in the center. they will never know what it is, but it is something that mothers in japan would do when making temari and gifting them to their children. i think essentially it's a good luck charm or just something sweet you would like for your kid. These make wonderful christmas tree ornaments. Light, indestructable and beautiful. Have it done in an intensive 2 days working with lots of unravel and such XD the spaces are not so equal and threads was inside out, haha. thanks a lot!